The 14th year of the all-free National Night Out event took place at Delano-Hitch Recreation Park in the City of Newburgh on Tuesday, August 2, 2011. 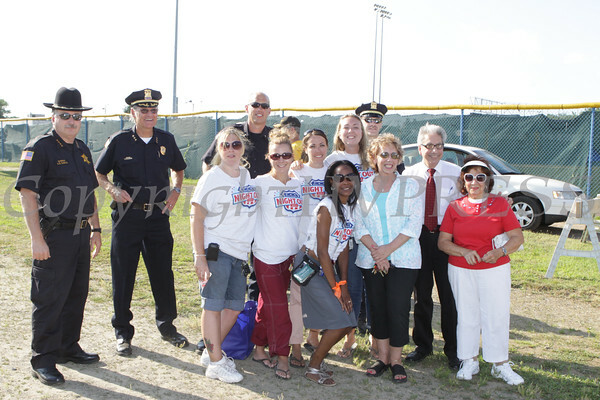 Orange County Sheriff Carl Dubois, Newburgh Police Chief Michael Ferrara, Dawn Wikin, Lt. Bill Rose, Jen Howard, Lauren Owens, Tharicia McZorn, Kristina Hanlon, Lt. Bruce Campbell, Councilwoman Christine Bello, Mayor Nicholas Valentine, and Deputy Mayor Regina Angelo, at the City of Newburgh's 14th National Night Out Against Crime on Tuesday, August 2, 2011 in Delano-Hitch Park. Hudson Valley Press/CHUCK STEWART, JR.